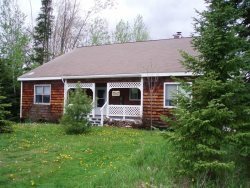 Grandma's Guest House is located just steps from Lake Superior and is a quintessential summer guest cottage. The guest house features your own deck overlooking Lake Superior. You do not have water access at the guest house... the deck sits right on the water looking west perfect for viewing sunsets or watching the Madeline Island Ferry come and go in the harbor. The cottage features two bedrooms (queen bed in one and two twins in the second bedroom), a bath with shower, wood burning fireplace in the living room and full kitchen. Always friendly and super accommodating. We recommend you to all our friends, and I have written about your rentals in my travel pieces about Madeline Island, which have published in City Pages and in a USA Today publication. This is our third year in a row renting Grandma's Place and we are already counting down the days until we can book next year's getaway to the same location. When we step out the door of the screen porch and onto the deck overlooking the water, we truly feel as though we've come home. If I could ever work it out, we'd live on the island - we love it that much. Thanks for making our stay so easy every year!